WORRIED sporting groups fear membership numbers could plummet when one of the city’s premier athletics hubs is closed for maintenance work. The comments come as a lengthy period of work to improve the current state of the running and cycling track is due to begin – one which a city cycle group fears could cause membership numbers to plummet. Starting on Monday, essential maintenance, cleaning, painting and repairs will take place to improve the state of the track, which is used by thousands of people across the area. Portsmouth School of Cycle Racing is among those to use the facility and was worried the latest round of works could impact club numbers. Guy Watson, founder of Portsmouth-based Internet Cycling Club, i-Team.cc and head coach Portsmouth School of Cycle Racing & i-Team racing development squad, said: ‘Whilst we understand that the facility needs refurbishment, this is the third time that we have lost the use of the track in five years. ‘I just wish the refurbisment could have been combined with the recent lighting upgrade, as the disruption to our user group has already been huge, with young riders moving on to other sports, which often means we lose parents who form our core group of coaches and volunteers. The track’s latest set of improvements has been commissioned by Portsmouth City Council in conjunction with BH Live, the social enterprise which operates seven of the island’s sporting venues and leisure centres. The project is due to take up to seven weeks to complete and the tracks will be temporarily closed during this time. BH Live has advised the clubs and schools who regularly use the facility. Phil Budd, coaching co-ordinator at the City of Portsmouth Athletics Club welcomed the investment but said more was needed. He warned Portsmouth’s premier sporting venue was at risk of being overshadowed by rival facilities elsewhere, and could lose out on hosting key competitions like the Hampshire Athletics Track and Field Championships. 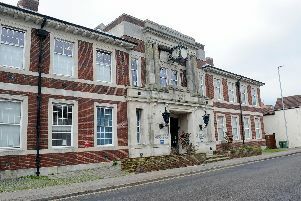 He said: ‘There are some very ambitious councils and clubs around and Portsmouth needs to make sure it doesn’t lose out. The athletics club has struck a deal with the Royal Navy to use its Portsmouth sporting hub, HMS Temeraire for five weeks. Mr Budd said the situation was ‘inconvenient’ for members but accepted that it was necessary to allow the improvement works at Mountbatten. Councillor Steve Pitt, Portsmouth’s culture, leisure and sporting boss, said: ‘It's important we continue to invest in our sporting facilities and make sure they are well maintained for people to enjoy.